Розглянуто поширення галактичних космічних променів у геліосферних магнітних полях. Одер-жано наближений розв’язок рівняння переносу космічних променів на основі методу, який враховує малу величину анізотропії кутового розподілу частинок. Досліджено просторово-енергетичний розподіл інтенсивності і анізотропії галактичних космічних променів і оцінено потік енергії космічних променів. 3. А. Долгинов, И. Н. Топтыгин, "3. Многократное рассеяние частиц в магнитном поле со случайными неоднородностями". Журн. эксперим. и теор. физ. 51 (6), 1771—1783 (1966). 5. Ю. Л. Колесник, Б. А. Шахов, "Влияние гелиопаузы и стоячей ударной волны на распространение галактических космических лучей в стационарной модели гелиосферы". Кинематика и физика небес. 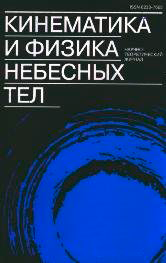 тел. 28 (6), 3—16 (2012). 7. Ю. И. Федоров, "Модуляция интенсивности галактических космических лучей в турбулентной гелиосфере". Кинематика и физика небес. тел. 31 (3), 3—22 (2015). 8. Б. А. Шахов, Ю. Л. Колесник, "Итерационный метод решения краевых задач теории распространения космических лучей". Кинематика и физика небес. тел. 22 (2), 100—108 (2006). 9. Bisschoff D., Potgieter M. S. New local interstellar spectra for protons, Helium and Carbon derived from PAMELA and Voyager 1 observations (2015). 10. L. F. Burlaga, N. F. Ness, E. C. Stone, "Magnetic field observations as Voyager 1 entered the heliosheath depletion region". Science. 341, 147—150 (2013). 12. L. I. Dorman, M. E. Katz, Yu. I. Fedorov, B. A. Shakhov, "Variation of cosmic-ray energy in interplanetary space". Astrophys. and Space Sci. 94, 43—95 (1983). 13. L. A. Fisk, W. I. Axford, "Anisotropy of solar cosmic rays". Solar Phys. 7, 486—498 (1969). 14. V. Florinski, N. V. Pogorelov, "Four-dimensional transport of galactic cosmic rays in the outer heliosphere and heliosheath". Astrophys. J. 701, 642—651 (2009). 15. L. J. Gleeson, W. I. Axford, "Solar modutation of gatactic cosmic rays". Astrophys. J. 154, 1011—1026 (1968). 16. L. J. Gleeson, I. H. Urch, "A study a force-field equation for the propagation of galactic cosmic rays". Astrophys. and Space Sci. 25, 387—404 (1973). 17. L. J. Gleeson, G. M. Webb, "Energy changes of cosmic rays in the interplanetary region". Astrophys. and Space Sci. 58, 21—39 (1978). 18. M. L. Goldstein, R. Ramaty, L. A. Fisk, "Interstellar cosmic ray spectra from the non-thermal radio background from 0. 4 to 400 MHz". Phys. Rev. Lett. 24 (21), 1193—1196 (1970). 19. X. Guo, V. Florinski, "Galactic cosmic-ray modulation near the heliopause". Astrophys. J. 792, 18 (2014). 20. K. Herbst, B. Heber, A. Kopp, et al., "The local interstellar spectrum beyond the heliopause: What can we learn from Voyager in the inner heliosheath?". Astrophys. J. 761, 17 (6 p) (2012). 21. J. Kota, J. R. Jokipii, "Are cosmic rays modulated beyond the heliopause?". Astrophys. J. 782, 24 (2014). 22. S. M. Krimigis, R. B. Decker, E. C. Roelof, et al., "Search for the exit: Voyager 1 at heliosphere’s border with the Galaxy". Science. 341, 144—147 (2013). 23. R. Manuel, S. E. S. Ferreira, M. S. Potgieter, "Time-dependent modulation of cosmic rays in the heliosphere". Solar Phys. 289, 2207—2231 (2014). 24. H. Moraal, "Cosmic ray modut ation equations". Space Sci. Revs. 176, 299—319 (2013). 25. E. N. Parker, "The passage of energetic charged particles through interplanetary space". Planet. and Space Sci. 13 (1), 9—49 (1965). 26. J. S. Perko, "Solar modulation of galactic antiprotons". Astron. and Asrophys. 184 (1), 119—121 (1987). 27. M. S. Potgieter, "Solar modutation of cosmic rays". Liv. Rev. Sot ar Phys. 10, 3—66 (2013). 28. M. S. Potgieter, "A very local interstellar spectrum for galactic electrons, protons and helium". Brazil J. Phys. 44, 581 (2014). 30. V. S. Ptuskin, H. J. Volk, V. N. Zirakashvili, D. Breitschwerdt, "Transport of relativistic nucleons in a galactic wind driven by cosmic rays". Astron. and Asrophys. 321 (2), 434—443 (1997). 31. J. D. Richardson, L. F. Burlaga, "The solar wind in the outer heliosphere and heliosheath". Space Sci. Revs. 176, 217—235 (2013). 34. E. C. Stone, A. C. Cummings, F. B. McDonald, et al., "Voyager 1 observes low-energy galactic cosmic rays in a region depleted of heliospheric ions". Science. 341, 150—153 (2013). 35. R. D. Strauss, H. Fichtner, "Cosmic ray anisotropies near the heliopause". Astron. and Astrophys. Lett. 572 (2014). 36. I. H. Urch, L. J. Gleeson, "Galactic cosmic ray modulation from 1965-1970". Astrophys. and Space Sci. 17, 426—446 (1972). 37. H. J. Volk, "Cosmic ray propagation in interplanetary space". Revs. Geophys. and Space Phys. 13 (4), 547—566 (1975). 39. W. R. Webber, F. B. McDonald, "Recent Voyager 1 data indicate that on 25 August 2012 at a distance of 121. 7 AU from the Sun, sudden and unprecedented intensity changes were ob terved in anomalous and galactic cosmic rays". Geophys. Res. Lett. 40, 1665—1668 (2013). 40. M. Zhang, X. Luo, N. Pogorelov, "Where is the cosmic-ray modulation boundary of the heliosphere?". Phys. Plasmas. 22 (9), 091501 (2015).